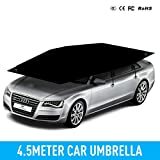 Looking for car tent or car umbrella to shelter your car? 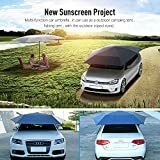 Can you imagine if we can have car umbrellas to protect it from rain, extremely hot sunshine, snow and other unforeseen incident? Usually, when we have a car, we’d love it like a baby. Therefore, we always do something to protect it from any harm. 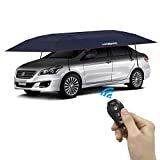 If you agree with me, let me introduce you to the top 10 best car umbrellas or car tent which you can consider to use for your adorable car protection. These umbrellas for car can put your worries aside in most condition wherever you park your cars. Besides, you might also consider other materials for your car such as Best All Season Tires, Car Wiper Blades, Car Vacuum Cleaners, Car Canopies, and Car Seats for Baby and for Infant and more. 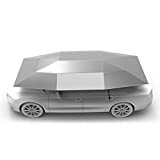 Check out the top 10 best car umbrellas in 2019 we have enlisted below. If you’re looking for a high quality and stylish solution, Lanmodo car umbrella might be the right one for you. This car umbrella or car tent is designed for the people who loves cool thing. Made of extendable stainless steel, Lanmodo umbrella for car or car tent promises a solid stability and the long durability. No matter how bad the weather condition is, you can rest assured about the safety of your car. The 304 stainless steel is also rust-free, which is something you can’t find in many other car umbrella. The size of this car umbrella is 137.8 * 82.7 inches, so it can fit in almost all mid-sized cars. This pop-up car umbrella or car tent is from a Lanmodo family which is well-known for its reliable service. If you have a luxurious car, we recommend you to get this one because this car umbrella is well designed to attached with your car and protect your car from harm of bad weather. Having it, you will not worry anymore when you park your car in a place without the shelter. 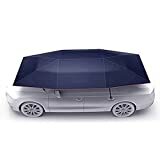 The car umbrella is also made of durable oxford cloth and is framed by the solid steel rods from all the sides, so it can withstand even against some conditions of a stormy weather. It can undertake 350 Mpa water pressure and nearly 0.1 -2.4 mm snow volume. It is also portable and weighs only 14.3 lbs. It’s the best ideal umbrella or shelter for your luxurious car. The Reliancer Semi-automatic car umbrella is made with good quality and affordable for most car owners. Made of durable polyester with a solid double windproof design, it has been known as impressed the people worldwide for its ability to shelter your car from heat, rain and snow. The car umbrella is thoroughly coated with the silver PU material, so it helps prevent the UV ray reflection as well. It has hooks and ropes in each corner which ensure an extra layer of stability to the tent. You can adjust the length of rope according to the size of your car at your convenience. Automatic AICase Carport Car Tent has a unique feature with automatic functionality. Yes, you don’t need to do anything. Just press the button, and you’re all done. It will automatically set up itself in the minutes. Given the fact, this car umbrella is an ideal design for your convenience and reduce the car owners’ effort. Speaking of the features, it comes with sunscreen cooling system, silicone protection, and also with a strong suction. Their windproof performance is also really great. Try this one out if you find it compelling for your car. Needless to say, this Lanmodo Anti-UV is the leading manufacturer when it comes to car tent or car umbrella and it is quite visible here. Out of the 5 car umbrellas, 3 are from Lanmodo already. The price and the functionality proof its quality and ability to stand against many harms to your car. It comes large in size but you can be customized as per your needs. It is made of Oxford cloths, so helps lowering down the temperature of car quickly. The best thing we love about this car umbrella is its ease-of-using. You can put it together within a minute. Another automatic car umbrella on our list but this one seems to cost lower than the earlier one. Yet, it is also functioned with the help of a remote control. Considering the fact, it gives you an extra facility. You can just sit in a place and make it works by itself. 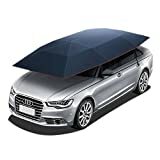 The top surface of this ISHOWStore automatic car umbrella is a bit larger as compared to the others, so it ensures full safety of entire car top roof. It is supported by the carbon steel frame and has nylon banding. Speaking of the portability, you can store it even in a bag. That’s convenient. Isn’t it? True to its name, Reliancer car umbrella functions Semi-automatically. This can also be used as a car canopy since it is large in size. Even after its dual functionality, it costs reasonable. It is probably the cheapest car umbrella on our list so far. With its adjustable windproof hooks and windproof snap fasteners, this car umbrella provides a reliable safety to the car. The most amazing thing about this car umbrella is that it comes with a dual windproof. 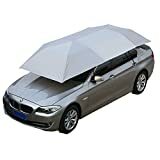 This one is certainly a good car umbrella at amazingly affordable rates. This Tent Carport is designed with only 6kg weight after folding up. It’s portable but also remote control. Though the tent surface is large in size, it is ideally designed for the mid-sized cars. It is designed with the double windproof, so can remain unfaltering even in a normal stormy weather. If you want to cover a small-sized car, you can customize the size easily. In a high temperature, it will help reduce the burden of high temperature inside your car while parking in the open space. This car umbrella is manufactured by LopazShade. If you’re running on a tight budget and want a fairly good car umbrella, this car umbrella might meet your needs. It doesn’t cost much and offers a reliable service. It promises to offer the multi-car protection which is indeed a unique feature. The mounting and unmounting procedure is extremely easy. You can make it function with the help of a remote or you can also set it up manually. It is designed with a great suction cup, so balances the temperature smoothly. Here comes the simplest car umbrella on our list. It is at the lowest priced which you help you to reduce some tension on thinking too much about your budget. Speaking of simplicity, it is so easy-to-use that even a young adult can put it up together. Another good thing we found about this car umbrella is that it is universal fit. Made of pure nylon coated with PEVA materials, it offers a steadfast stability. Due to its low-price and good service, it is a loved car umbrella in the market. I hope this article will help you get an idea of the car umbrella of your need. Tell us if you love any of them, or check out the most recommended car canopies if the umbrella is not the best option for you.